Today at the 2015 Los Angeles Auto Show, Porsche unveiled its latest addition to its track-only vehicle roster, the Cayman GT4 Clubsport. But don’t just assume this is just the road going version of the Cayman GT4 with the addition of a roll cage and the subtraction of an interior, as Porsche has made a number of revisions to the car for motorsport duty. Perhaps the most noticeable mechanical distinction between the Clubsport and the road car is that, while the Cayman GT4 made for the street is a manual gearbox-only affair, the Clubsport is quite the opposite. It’s outfitted with Porsche’s six-speed, paddle shifted PDK dual clutch transmission, which is hooked to the same 385 horsepower, 3.8-liter flat-six engine that’s found in the road car. A mechanical locking differential, tuned specifically for racing use, is also outfitted as standard on the GT4 Clubsport. The suspension gets a thorough reworking as well, as the lion’s share of its light weight components are borrowed from the 911 GT3 Cup car. Those bits and pieces also contribute to the GT4 Clubsport’s 2866-pound curb weight, a drop of nearly 100 pounds versus the road-going model. Enhancing the car’s handling even further is its revised stability control software that’s been calibrated for use with racing slicks, the latter of which are supplied by Michelin and are wrapped around 18-inch forged aluminum wheels. Stopping duties are handled by one-piece, six-piston aluminum fixed calipers up front and four piston units at the rear, with 15-inch steel discs at all four corners. Along with the requisite safety equipment that includes a well-bolstered race seat, six point harness, and a fire suppression system, customers in North America will be able to choose between either an 18.5 gallon or an optional 26.5 gallon FIA FT3 safety fuel tank. Homologation details are still in the process of being finalized, but Porsche says they expect the GT4 Clubsport to be certified for use in VLN Long Distance Championship Nürburgring, IMSA Continental Tire Sports Car Championship, Pirelli World Challenge GTS, the Ultra 94 GT3 Cup Challenge Canada, the PCA Club Racing Cayman GT4 Clubsport Trophy and various other club-level competition events around the world. As of today, interested parties in the U.S. can purchase a Cayman GT4 Clubsport directly from Porsche Motorsports North America for use in the 2017 racing season for approximately $215,000. Have a look at the press release below for additional details on the Cayman GT4 Clubsport. 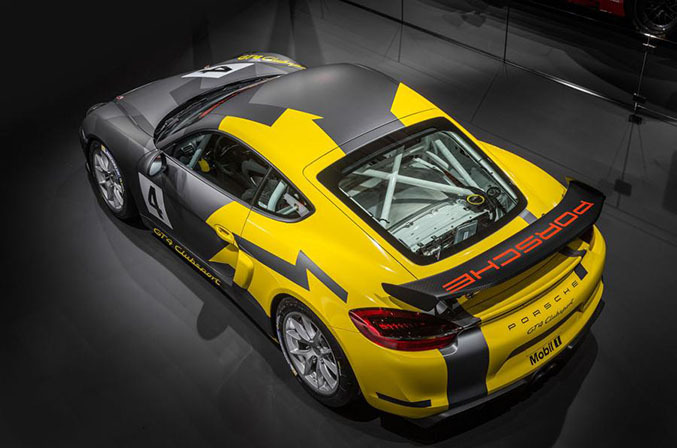 LOS ANGELES, Nov. 18, 2015 /PRNewswire/ -- Porsche has added a new sports car for amateur and club racing to its Motorsports fleet: The Cayman GT4 Clubsport celebrated its world premiere today at the Los Angeles Auto Show. The 385 hp (283 kW) mid-engine entry level racer for motorsport, which is not legal for road use, is based on the successful street-legal Cayman GT4 sports car. Sales of the racecar by Porsche Motorsport North America start with the unveiling at the auto show. Just like its well-developed production sibling, the Cayman GT4 Clubsport is powered by a 3.8-liter flat-six engine, positioned directly behind the driver's seat. The racing version features a modified six-speed Porsche double clutch PDK transmission with shift paddles on the steering wheel and a mechanical rear-axle locking differential specifically for racing. The lightweight strut front axle is taken from its big 911 GT3 Cup brother, which is campaigned in 20 one-make Porsche championships around the world. 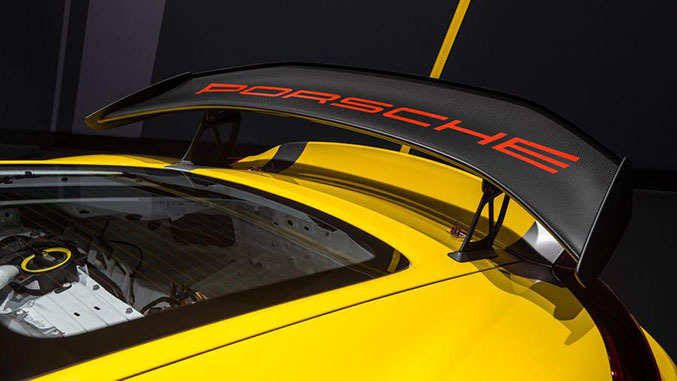 An enhanced lightweight strut suspension with transverse arms adopted from the 911 GT3 Cup, is at the rear. The racing brake system features large 15-inch (380-millimeter) steel brake discs all round. One-piece, six-piston aluminum fixed calipers are located at the front, with a four-piston equivalent at the rear. The anti-lock brake system features twelve settings. The Electronic Stability Program has been recalibrated for slick racing tires. The power steering is operated electro-mechanically. Tipping the scales at just 2,866 pounds (1,300 kilograms), the Cayman GT4 Clubsport, is a virtually turn-key racecar, delivered from the factory with a welded-in safety cage, a racing bucket seat as well as a six-point harness. The North American version comes with an 18.5 gallon (70-liter) or an optional 26.5 gallon (100-liter) FIA FT3 safety fuel tank. 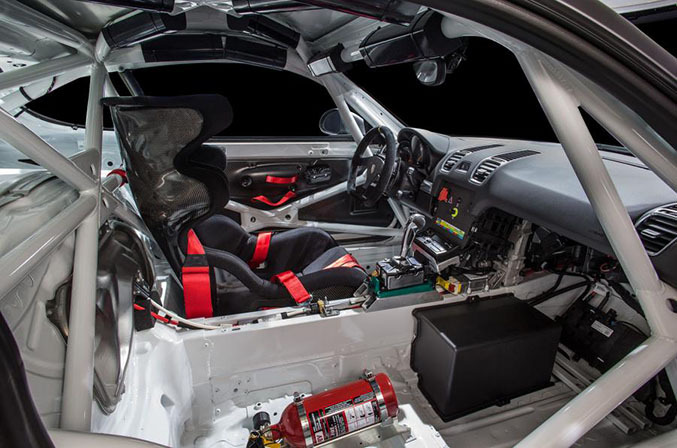 The car also comes with a central fire extinguisher system. Mounted on the front axle are 18-inch five-bolt forged wheels with 25/64-18 tires while the 18-inch five-lug forged wheels at the rear have 27/68-18 tires. Michelin® supplies the racing slicks. In the USA, the new Cayman GT4 Clubsport racecar is available directly from Porsche Motorsport North America for $165,000. For 2016, homologation is anticipated for race series such as the VLN Long Distance Championship Nürburgring, the Ultra 94 GT3 Cup Challenge Canada and PCA Club Racing Cayman GT4 Clubsport Trophy East, as well as for other club-level competition events around the world.